3 rounds are in the books and the track is closed till 7:00am tomorrow morning. Scotty Ernst kept the race program moving along at a brisk pace and the day went by very fast, especially with all the fun we were having. Tomorrow we will run 1 last qualifier before we start the mains. Our generous sponsors will be giving away a ton of loot to the racers tomorrow and the spectators again have multiple chances to win some awesome gear with 2 more drawings at 1:00 and 4:00pm. On the racing side of things the heavily contested Stock Short Course Truck class has been dominated thus far by HPI’s John Schultz in his Blitz ESE Pro truck. 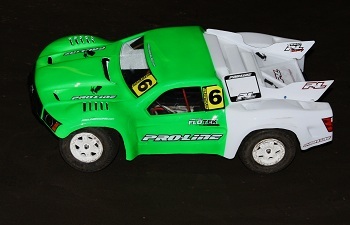 In the competitive Modified 2WD and 4WD classes TLR’s Dustin Evans has looked very strong through 3 rounds. However, we are running rocket rounds for qualifying so a fast run in the lone qualifier tomorrow can bump anyone up to the TQ position. And before we start the mains tomorrow all the TQs from the 5 different classes will compete in an exhibition race with Losi’s new RTR SCBs.